You've heard the ondes Martenot in Messiaen's Turangalila Symphony, but have you ever wondered whether there might be more to it? Indeed there is, and the leading exponent and specialist in rare instruments is Thomas Bloch, pupil of Jeanne Loriod, and now professor of ondes Martenot in Strasbourg. Messiaen is represented by a small piece, and Martinů by a substantial 15 min Fantasie with chamber ensemble. 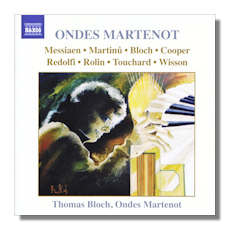 Bloch's own compositions put the instrument through its paces, and he even assembles nine Ondes Martenots for his Sweet Suite, which is a touch too sweet for my taste. But the whole compilation is invigorating and wide ranging in composing styles of the day, bridging categories, as do the performers according to their biographies. There is a huge cast of collaborators and this disc will give pleasure and instruction to musical explorers. Very fully documented, with everything you could ever want to know about this semi-obsolete instrument (no longer being produced). Bloch's discography includes another from Naxos (8.555295 Amazon - UK - Germany - Canada - France - Japan - ArkivMusic - CD Universe ), on Glass Harmonica.